July 31, 2018, 3:29 PM · Longtime Cleveland Orchestra concertmaster William Preucil has resigned from his teaching position Cleveland Institute and has been suspended from the Cleveland Orchestra following the publication last Thursday of an article in the Washington Post that details a 1998 incident involving a violinist named Zeneba Bowers, who was in her mid-20s and a member of the New World Symphony at the time. The article focuses on sexual harassment, misconduct and assault in the classical music world. Allegations of misconduct by Preucil also were outlined more than a decade ago in a 2007 piece called 'Sour Notes' in the Cleveland Scene, which alleges both sexual misconduct and nepotism by Preucil. The article led to much discussion (including the comments on this Violinist.com blog from the time) but did not lead to any changes in Preucil's employment. Preucil's suspension from the Cleveland Orchestra occurred on Friday. In a statement released to multiple news organizations, Cleveland Orchestra’s executive director André Gremillet said: "The Cleveland Orchestra was not aware of the allegations reported by The Washington Post about William Preucil in their July 26, 2018 article. We take this matter very seriously and will promptly conduct an independent investigation. Mr. Preucil has been suspended until further notice." 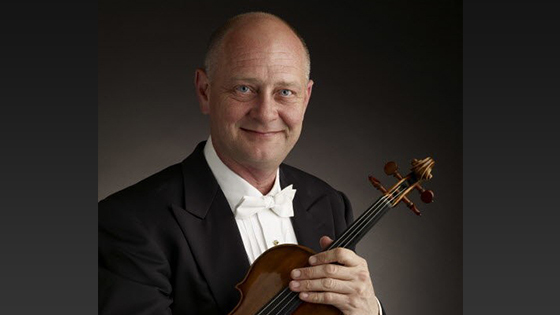 Preucil has served as concertmaster of the Cleveland Orchestra since 1995. On Saturday Preucil resigned from his position as Distinguished Professor of Violin at the Cleveland Institute. The day before, Cleveland Institute of Music and CEO Paul W. Hogle had issued the following statement: "The board, faculty and staff of the Cleveland Institute of Music are deeply troubled by the Washington Post story discussing issues of sexual harassment in classical music but will not comment on specific allegations made in the article. CIM has zero tolerance for behavior that puts our students at risk. CIM has a well-defined policy regarding sexual harassment and reporting, and our Title IX officer and designated reporters thoroughly investigate any claims related to sexual discrimination and harassment. "We have a rigorous requirement that every staff and faculty member attend regular training on preventing sexual harassment and misconduct in the workplace. We talk with – and listen to – our students in a variety of forums about personal safety. We also actively encourage them to seek assistance from mental health and crisis counselors which we make available – through the extensive resources available through our partnership with Case Western Reserve University – to our entire student body." July 31, 2018 at 09:45 PM · Robert Caro, in his multiple book biography of LBJ, opens with the premise that: "Power Reveals" for many power leads to corruption and many forms of bad behavior. In some power is the means to rise to greatness. Unfortunately, humans are never all one thing. LBJ was a pig, but he also had compassion for poor people. Many of our hero's have proverbial "Feet of Clay." Little wonder that the world of professional music has it's share of lousy behavior among those who are the best musicians on the planet. The lesson to be learned is that a total focus on technical skills without teaching people about compassion and other human values leads to problems. I have a suspicion that Preucil had his share of "abuse" growing up as a musician and that the adults looked the other way. Not as a way of excusing the behavior, but as a caution that many of us see the misuse of power and keep our mouths shut lest we incur the wrath of the powerful ourselves. #MeToo is changing the world and it is about time. Power Reveals indeed, and now the abuse of power is being revealed as well. It's past time. July 31, 2018 at 11:07 PM · I agree with George Wells except that I decline to speculate on Mr. Preucil's life as a young person. July 31, 2018 at 11:20 PM · It will be interesting to see whether the Mainly Mozart festival in San Diego will follow suit with the institutions in Cleveland. Preucil and other members of his family have had prominent roles in the festival since its inception 30 years ago, with Preucil often sitting in the concert master position. It is a shame that so many years have passed since the alleged misbehavior; Had the consequences been more immediate, the misbehavior would likely have had a smaller scope. August 1, 2018 at 12:02 AM · My initial reaction was "Wouldn't this have been par for the course at the time", but having read more details in Wikipedia, it seems blackmail was involved as well. A female violinist acquaintance of mine at Prussia Cove in the '70s had just got accepted to study with a certain top teacher and had heard that he wasn't a very nice person, and speculated that it showed in his playing. But I don't remember hearing about any of this sort of thing said about him. August 1, 2018 at 12:03 AM · It always amazes me in this 'new me too age' where accusations from, what, nineteen years ago with no due process, little if any corroborating evidence or even the perspective of event is given, the accused is automatically tried and found quilty by the media and academic lynch mob with no investigation whether the charges have any merit or whether the accuser has any less than honorable motives. That, to me, is contemptible cowardice. Since the subject of LBJ (former US president Lyndon Baines Johnson) has come up, I'll extend the discussion a bit. It's well known that LBJ cheated on his wife and had multiple mistresses. A man who lives this way -- well, it's not hard to believe he could be part of a coup d'état to become president. Dad, who passed 25 years ago, strongly suspected that LBJ was the strategic mastermind behind the assassination of JFK (John Fitzgerald Kennedy), LBJ's predecessor. I didn't give this view much thought at the time Dad voiced it; but now, especially in light of what I've heard and read since 2013, I strongly support this view myself. "Those who live in glass houses shouldn't throw stones ~ "
August 1, 2018 at 08:09 AM · At this point, the heads of academic institutions and their legal representatives are well aware of the consequences of "institutional complicity" when it comes to these sorts of issues. Just look at what happened with Penn State and that whole mess with the child molester Jerry Sandusky. Suspending an employee while an investigation is ongoing is standard procedure. August 1, 2018 at 02:35 PM · As a female musician having entered the professional world in the early '70's, I am not at all surprised by what we always heard about, knew about, and in certain instances, experienced ourselves. Those 'at the top' yielded more clout and the ability to make or break one's career if one didn't comply. I was one of a small handful that were part of a whistleblower experience in the late '60's. Luckily, our voices were heard at our private school. Surprisingly, the perpetrator was able to finish out the year before being sent away. Dealing weekly at age 17 with an instructor after the fact, was continually challenging and unsettling. The lesson that I take away from all of this is, that with great gifts comes great responsibility. August 1, 2018 at 04:50 PM · A sad state of affairs. True or not it taints the entire group associated with it same as the Jerry Sandusky case.Not so much at an obvious level as the association. I suspect it's probably true.Until then it really is a "he said, she said". I have to ask why something that happened in 98' is only now coming to the surface.If the accuser feels so wrongly harmed why take 28 years to come clean about it? These kinds of cases are all boiling to the surface in the press. I can count probably a half dozen similar cases in the last 6 months. And how should we treat these people if guilty? Are they sick or just plain evil? The truly sad thing is it happens in various ways all across the globe. He might have been one of the few to get caught or implicated...look at findings in the Catholic church.Been going on for years. Probably happens in the Protestant church too.They sweep it under the rug, pay people off and pretend nothing ever happened. I'm getting some interesting stories posted as anonymous comments. I'd like to let you know that I will not approve those. If all the parties in a story are anonymous, including the person telling the story, this can only be journalistically be considered a rumor. Thank you for understanding. August 1, 2018 at 08:46 PM · Regarding comments like "why now, after X years?" I have taught many students (not in violin, but I'm a college professor) and my female students who have come forward and told me that they've be harassed or assaulted often only come to me because they know I will listen to them and believe them. In our society we tend to blame the victim, and in cases of extreme power imbalance the victim has heard all too many times that worse things will happen for coming forward. This MeToo revolution has been brewing for a long time, and it's about time. The bad behavior of men and women in power has been allowed to go on for generations, and is still all too acceptable in society. Yes what I wrote is speculation but, as a person who was both physically and emotionally abused as a child and as an adult working through the long-term problems, I have learned that abused people often become abusers and they have to work to avoid repeating the pattern. That being said, I'm lucky and decided to be child-free in my teens (kept that promise) and with many years of therapy I have never abused anyone. My point is that for me, and others, adults saw what was going on and did nothing that might have stopped the abuse. That is a common story among the community of adults who were abused children. I'm ultra aware of abusive behavior and I've sounded the alarm more than once in my over 70 years. August 2, 2018 at 04:15 AM · Anyone wondering why women are only now coming forward after X number of years need only look at the comments at WaPo, etc., along with the comments on the 2007 Cleveland Scene article. The victim-blaming and misogyny are in full force. August 2, 2018 at 12:56 PM · @Elisabeth: You mentioned Tchaikovsky and "the aching beauty of his 'Pathetique' Sixth Symphony (which he didn't live to hear) …." August 2, 2018 at 07:12 PM · It's fine to prefer anonymity, but if I also don't know the poster than it's simply irresponsible on my part to approve those comments. August 2, 2018 at 09:11 PM · Laurie, if anonymous posters are sending you stories, perhaps you could direct then to the email address for authors from the Post? The Post is extremely good about vetting stories before running them. People try to discredit them by giving them fake tips. August 2, 2018 at 11:32 PM · This is actually an instance where good journalism has been very important. Part of the reason why the first article that was written 10 years ago (in the Cleveland Scene) did not make as much of an impact was the fact that the article, while it contained much good journalism, also took an opinionated tone, making it easier for those who did not wish to believe unpleasant truths to reject everything in the article wholesale as just rantings in a rag. August 3, 2018 at 10:22 PM · Hate to say it but when you walk crooked and you manipulate auditions and people . YOU GET WHATS COMING TO TOU. Let this be a huge lesson to all corrupt teachers and musicians in positions of power . August 3, 2018 at 10:23 PM · I had not read this article until now.Thanks for the link. I think there is a high level of discomfort in looking at these kinds of things. People would rather look the other way and hope it disappears than open Pandora's box, which in itself, is sad. I don't want to believe that people accuse the victims. It seems they do. Maybe this is also a way for the accusers to deal with something they have a difficult time admitting could have happened. I wouldn't be accusing of anyone unless I knew more about it. could cause them more harm from the offender is a terrible weight to carry. I intended no disrespect to anyone in that unfortunate position. August 4, 2018 at 01:35 PM · I’d love to see some of those people who bashed Darcy and the Cleveland Scene article back in 2007 show their faces and eat crow. “I know the people involved”, a few jealous and negative people in the orchestra, yeah, ok.
August 4, 2018 at 05:07 PM · Regarding comment from previous poster: "Isn't there a quote from Scripture which goes something like 'Those who live in glass houses shouldn't throw stones'?" August 7, 2018 at 03:35 AM · Jim sometimes folks confuse that old saying with John 8:7. Cheers, Paul. August 7, 2018 at 12:59 PM · Paul, yes -- I can see how they would.